The "Gsindboden" can be found on the Naturnser Nörderberg (Tramontana Mountain) and is a level forest clearing where, according to legend, the "Gesinde" (servants) of the surrounding farmsteads met and cavorted with all kinds of delivery. 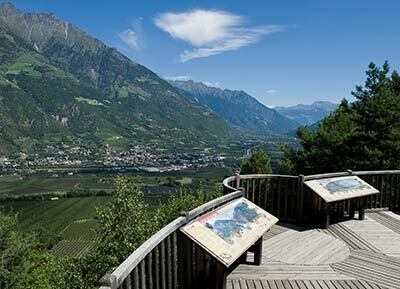 A viewing platform with display boards inform visitors about the rich cultural history of the Upper Vinschgau, the discovery of "Ötzi" and the life among the vineyards, apple orchards and eternal ice. An idyllic rest area with grandiose views overlooking the scenic contrasts – from the fruit orchards and vineyards of the valley through to the extreme alpine agricultural settlements up to the snow – glacier covered summit regions. The "Gsindboden" opens up on the Naturnser Nörderberg at a height of 675 metres – a level forest clearing where, according to legend, the "Gesinde" (servants) of the surrounding farmsteads met and cavorted with all kinds of delivery. Do you fancy a tour with magnificent panoramic views? It is best to start the circular route from Tschirland. Following the signposts (Waldschenke), the trail leads through the fragrant meadows and magnificent apple orchards, slightly ascending. You reach the "Waldschenke" after around 30 minutes, an inviting forest tavern to enjoy refreshments. A further 30 minutes uphill through the cool forest takes you to the entry of an old quartz stone quarry. The info board next to the tunnel entrance reveals even more about the important raw material. And so it goes on: you encounter an idyllic rest area with views overlooking the valley at the "Gsindboden" halfway point. Not far to go from here – just another 15 minutes! Arriving on the viewing platform, we take in the breathtaking panoramic views. The way back leads through mixed forests downhill to the Tschirland Haide, the scene of ancient farming tradition with diverse flora and fauna. The hike is easy to moderate, some ascents/descents, quite rocky, uneven pasture and forest trails, sturdy hiking boots necessary. The Jesus–contemplation trail is situated at the foot of the Nörderberg Mountain and consists of 15 "stations", similar to the Way of the Cross. From the Annunciation, Nativity to the Resurrection and the mission of the Holy Spirit. The contemplation trail incorporates the nature, landscape, character of the terrain and the unique plant diversity into its message. For this reason, parts of the route vary greatly to take in the various points of reflection. We walk from the centre, along Bahnhofstrasse and reach Naturns’ sports field. From there we continue on until we reach the start of the Jesus contemplation trail. 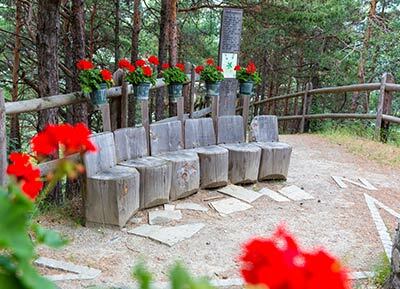 This unique trail invites you to contemplate and take time out, and consists of 15 stations, just like the Way of the Cross. The nature, landscape and character of the terrain is always incorporated into its message. A short description of the individual stations can be found in the tourist office at the entrance to the contemplation trail. Those wanting to walk for longer can follow the steep track from "die Kreuzigung" station to the Unterschwarzplatzhof and then continue on to the "Gsindboden" along trail no. 11. The viewing platform there offers a magnificent panoramic view over the whole valley and even into Val Senales. The place where Ötzi was discovered, Juval Castle (owned by extreme mountaineer Reinhold Messner), the St. Prokulus church and much more can be seen along the route. The return is made via the Tschirland Heide and Tschirland towards Naturns or via the Haslhof towards Tabland and via Tschirland to Naturns. The alpine pasture experience trail is located in the heart of the Texel Group Nature Park in the Pfossen Valley. An educational trail, which brings hikers closer to the unique nature and cultural landscape of the Pfossen Valley. Information boards along the entire route are used to describe how natural forces influenced the formation of the landscape. Alpine agriculture in the Pfossen Valley is just one of the subjects examined alongside flora, fauna and geology. The alpine pasture experience trail is a route, which enhances the awareness of the connections we have to the nature and our surroundings and promotes the activities of those working in the protected areas. The starting point of the education trail is the car park by the Gasthaus Vorderkaser in the Pfossen Valley and the trail passes the Mitterkaseralm (lodge) and Rableidalm (lodge), leading to the Eishof. You can get a fundamental overview of the history of the Pfossental in the Vorderkaser. The Vorderkaser show dairy can be visited after you have learned all about cheese manufacturing from the display board. Continuing on into the valley and passing the numerous information points, you eventually reach Mitterkaser, where you can learn about the traditional production of butter. Historical records from the "Almbuch" (register of cooperative associations) allow modern hikers to immerse themselves into how hiking once was in times gone by. The reintroduction of the alpine ibex in the Pfossental is informatively presented at the Rableidalm (lodge). You finally reach the Eishof at a height of 2,081 metres above sea level with the unique geological conditions being particularly fascinating here. Stories and legends about the Schnals and Pfossen Valleys round off the experience hike and invite visitors to take in the mountain scenery of the Pfossental. 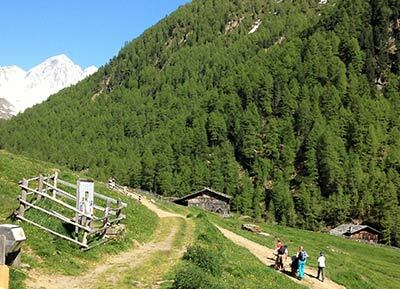 Seven stations along the circular route in the basin of Val Martello give an insight into what is known about the red delicacy. Hikers can learn about their legend, symbolic meaning, use in medicine as well as in ancient times, trivia about the Strawberry Queen and much more on the numerous information boards along the way. Farmsteads invite you to revitalise yourself along the way by sampling local berry, herb and milk products. 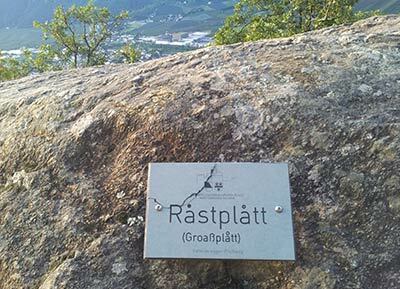 The start of the circular route is in Ennewasser, at the "Trattla" leisure centre. You continue north along the country lane, through the village of Salt to the bridge by the salt graben (sunken plain). Pass the bridge and then follow along the marked trail no. 22, through forests and meadows and along a forest trail towards the village of Gand, always following the "no. 22" markings. Cross the country road here and continue through the locality of Gand until reaching the cross-way for trail no. 36. Now follow this trail with the marking 36 out of the valley. The trail leads back to the starting point crossing the bridge, to the "Trattla" leisure centre. The Patleideregger church trail was the only connection between the village of Naturns and the Patleideregg with its farmsteads for centuries until the Sonnenberg road was completed in 1988 and the Untersteller cableway system put into operation. It also offered one of the very few access possibilities into the Schnalstal via the Fuchsberg and to the crossings into the Ötz Valley.